When it comes to social media, stars come in all shapes and sizes. The brightest among them can quickly become influencers and marketing darlings, and for many of them, their time is now. Sixty percent of marketers are increasing what they spend on influencer marketing, and 22 percent said it's their top customer acquisition tool. "Social influencers are the new celebrities," said Rick Song, ZEFR's global head and evp of media solution sales, during an Advertising Week discussion. More people have heard of Tonight Show host Jimmy Fallon than YouTuber Connor Franta. But Franta is better at engaging with his considerably smaller social following. ZEFR showed that while Fallon's 38.4 million reach across social platforms dwarfs Franta's 12.5 million reach, Franta has 66 percent better engagement. "It's not always about the size of the following, it's about the engagement," said Jeff Wolfe, vp, brand content director at LiquidThread. 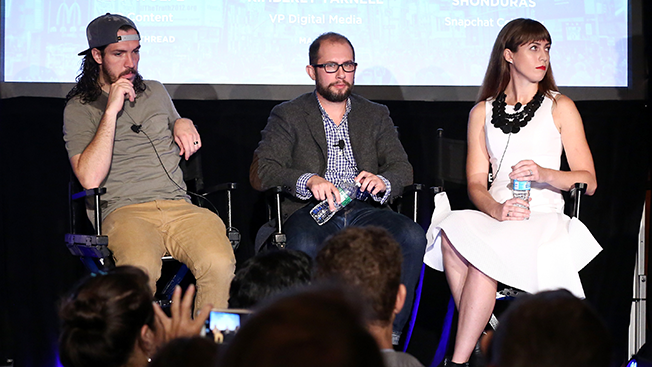 "What are people doing with the content—and using it and watching it?" he said. The type of platform you use is also key for driving engagement. Snapchat celebrity Shonduras, an influencer who has worked with retailers such as Loot Crate, said Snapchat provides for greater engagement because viewers are more likely to pay attention when photos disappear in an instant. Shonduras said he gets about 125,000 opens on average for his photos, but those are more valuable to brands than a YouTube video that gets a few million views. "Half my demographic is instantly responding to what I'm saying," he said. "The engagement and the level of personality is just outrageous." Most social media stars will tell you authenticity is the key to their popularity. To that end, it's important that brands link themselves with influencers who are also brand believers, because their fans will know if they're not being straight with them. Shonduras argued that his fans can see right away if a brand he's promoting is something he really believes in or if it's "just a job" for him. "I don't accept gigs unless I believe in the product or I believe in the brand," he said. From the marketers' side, finding an influencer who knows and even uses the brand helps with the collaboration process on a campaign. "[We] find the influencers, frankly, that like our brand, like the story we're trying to tell," said Kimberly Yarnell, vp of digital media for Macy's. For any campaign, the influencer and the brand each have their own goals, and they usually have their own way of accomplishing them. The key is to try and meet halfway. "It's making sure the brand, on one side, is being reflected very well in the content and that the influencer, on the other side, is being true to their tone and voice," said Wolfe. "I know what works well with my brand, and I know how to do it well," said Shonduras, noting that brands also have their own agendas. "If we meet in the middle, it's going to be a home run." Shonduras said he runs into problems when a brand he's working with gets too controlling with the messaging; after all, he argues, nobody knows his audience better than the guy who built it. "If you don't let me have all my creative freedom and you're just like, 'No, we need this hashtag, and we need this hashtag,' then my tweet just looks like a million different things," he said. "I have my ideas and, actually, they're ideas but they're also facts." It might sound simple, but if you find an influencer who works really well with your brand, you should keep going back to that well. Yarnell argued that Macy's isn't looking for one-and-done relationships with its influencers. "Where we've also seen success is trying to craft long-term relationships with influencers rather than doing one-off projects and then walking away from talent," she said. Continuing a relationship with a particular influencer helps both sides feel more comfortable working together and also conditions the audience—which, in turn, leads to better engagement. "At the end of the day, it helps lead to more compelling and authentic content," Yarnell said.